By almost any measure, Jered Weaver’s best two seasons came in 2010-11, when he threw well over 200 innings and was worth more than five WAR each year. My guess is that most people still think he peaked in 2012, when he was 20-5 with a 2.81 ERA, despite a terrifying decline in his strikeout rate, and if being a “20 game winner” isn’t what it used to be, it still does count for something in fantasy. Still, headed into 2013, I think most of us were worried about an impending drop-off thanks to lessened velocity and that strikeout decline, and we got it: Weaver’s 2013 was, by most metrics, his worst since at least 2009. Of course, not many of us expected that he’d fracture his left elbow in his second start of the season and miss nearly two months, either, and that’s obviously a factor in his down year. Gerrit Cole finished 60th in our end of season starting pitcher rankings. I’m going to go out on a limb and guess that he finishes quite a bit higher than that in 2014, because the only reason he finished that low this year is simply because the Pirates didn’t call him up to make his major league debut until June 11, giving him time to pitch only 117.1 innings on the season. When Jayson Werth left the Phillies after three consecutive seasons in which he was worth around five wins and jumped to the Nationals for a massive seven year, $126m contract after 2010, it was easy to bash it. He was headed into his age-32 season, he’d had injuries in his past, and he’d been very good, but never a superstar. That got easier when he had a very disappointing 2011 debut, then missed half of 2012 with a broken left wrist. The amazing thing about Jose Bautista’s breakout 2010 (54 homers, .422 wOBA) and arguably even better 2011 (43 homers, .443 wOBA) is that even when he’s not really able to come close to sustaining that production, as he’s been unable to in 2012-13, he’s still really, really good. 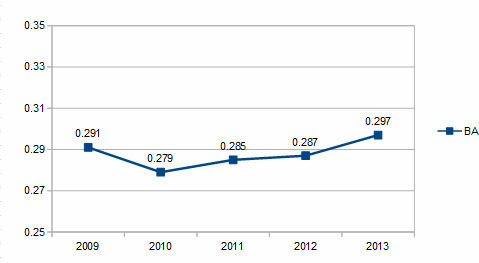 A .371 wOBA over the last two years may not be quite equal to what’d done before; it’s still 21st best in baseball. It’s somehow possible that he never did receive enough attention for what he’d done during those two seasons. Carl Crawford ranked #64 in our end-of-season outfield rankings, just above A.J. Pollock, who is only valuable for defense, Matt Joyce, who’s a mildly interesting platoon player, and Ichiro Suzuki, who retired in 2009. Remember when Asdrubal Cabrera was a rising star? 2011 doesn’t seem like it was that long ago, but for Cabrera it was. That year, he broke out as a fantasy star, hitting 25 homers with 17 steals and a .273/.332/.460 line in his age-25 season. Since then, he’s combined for 30 homers and 18 steals, and in 2013 he really cratered, putting together a lousy line of .242/.299/.402. Yet it seems to me that he still gets talked about like he’s a top-tier shortstop. Maybe that’s just me, or maybe it’s because “Asdrubal” is such a unique name, but it’s clear he no longer deserves that respect, finishing only 15th in our end of season shortstop rankings. Chase Headley: From Overrated to Underrated? It’s probably hard to overstate just how hyped Chase Headley was after his massive 2012, isn’t it? Were it not for the presence of Miguel Cabrera at the hot corner, Headley would have been the best hitting third baseman that season, thanks to his 31 homers, 115 RBI, and 17 steals. While there was something to be said for the fact that a ridiculous second-half hot streak was unsustainable and that he’d hit just 4 homers the year before, it was hard to see him not continuing to be very good in 2013, especially since the fences were coming in at Petco. Pretty static, right? A few bloops here & there and a little bit of BABIP luck or not slightly changes the numbers, but Kendrick has been essentially the exact same guy for five years in a row, if you only worry about batting average. Remember when Mark Trumbo came up in 2011 and finished second in the Rookie of the Year balloting, thanks largely to things like “29 homers and 87 RBI”, and we all laughed because his .291 OBP made him seem like a one-dimensional slugger who had caveman skills and little else? It seemed he’d be further marginalized in 2012 when Albert Pujols arrived and Kendrys Morales returned, but after a laughable attempt to play third base, Trumbo found a home in the outfield, as well as getting 38 starts at first base and DH. He maintained the power, but increased the OBP to .317, helped by a walk rate that went from an atrocious 4.4% to a still-not-great 6.1%.